For those unaware of what the Budleigh Salterton Literary Festival is about, check out the video of the 2018 event. Highlights from the Budleigh Salterton Literary Festival 2018, which featured Lucy Worsley OBE, Michael Rosen, Dan Cruickshank, Ben Kane, Dame Hilary Mantel and many more. Details for the 2019 event to be released during the summer - visit the event's website regularly for details. Budleigh Salterton Literary Festival is a growing event that always attracts famous and popular authors from all types of literature. The event, held 19th – 23rd September in 2018, features inspiring talks, readings and conversations with talented authors, scientists, playwrights, historians, broadcasters, economists, comedians and rising literary stars. Every year there's a diverse selection of critically acclaimed, award-winning authors, and we can't wait for all the details to be released closer to the time. All the writing talent is combined with a warm and welcoming atmosphere from the organisers and the locals, making it one of the most exciting literary festivals in the UK. Another reason to take note of this particular festival is the focus it puts on young and developing talent. Alongside youth events, there's a grand poetry writing competition for those under 12. Visit their website closer to the event for all the details and catch the lineup closer to the time. You'll need accommodation for the event, and The Victoria is only 20 minutes down the road along the beautiful South Devon coast. Use our 'Book Now' feature to check availability and book your room. 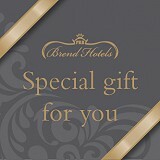 Victoria Hotel vouchers, our special gift for you. We currently hold four and half stars on Trip Advisor for The Victoria Hotel and Brend Hotels are holders of the accolade for AA Hotel Group of the Year 2015-16.